With the euphoria of the weekend’s events behind us, we now turn our attention to our next exciting event. It is our first joint venture with all the clubs at the Mutton Reserve Precinct, Haig Fawkner Cricket Club, Fawkner Netball Club, Fawkner Food and Bowls and Fawkner Tennis Club. Straight after our home game versus Moonee Valley our clubs will help host Fawkner Cinema Under the Stars, on the west ground. Auskick is just a wek away! With just over a week to go, now is the perfect time to register your child for the 2019 Auskick season. Auskick is avaialble for girls and boys aged 5-12. The Auskick program teaches your child the basic skills of Australian Rules Football, all in a fun, relaxed family environment. 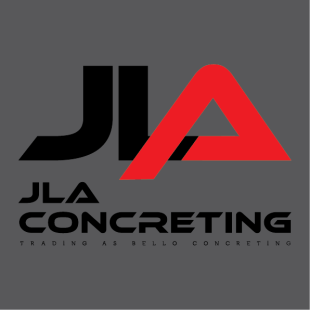 We are lucky to have JLA Group Concreting on board as a valuable 2019 sponsor. The support they provide the club and local community is deeply appreciated! 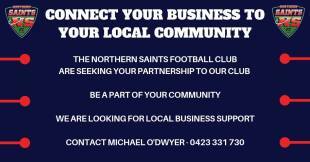 The perfect time to join the Northern Saints Family! 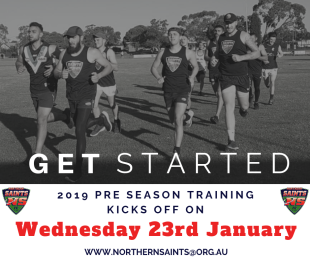 With the start of the new season now under way, and the core of our new look club starting to take shape, it is never too late to jump on board the Northern Saints bandwagon and help us on our 2019 football journey!! A huge thanks to Rob Lawson, past gun player for Fawkner Amateurs and fantastic photographer, who came down on Saturday and took some awesome photos from the seniors victory over Hadfield. With deep regret, the Northern Saints would like to pass on our condolences to the family of Allan Turner. Allan served with distinction on the committee of St.Olivers Football Club / BOPS. Allan was Junior Vice President from 1985-1989 and Senior President from 1991-1993. Allan was deservedly a Life Member of the club. Rest In Peace from the Northern Saints family. 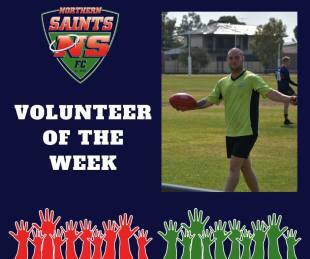 This guy could and should win Volunteer of the Week nearly every week. In football terms, he is the Brownlow Medalist, All Australian and Hall of Famer of Volunteers. He needs no introduction. Russell Dowling. Northern Saints Hall of Fame unveiled! 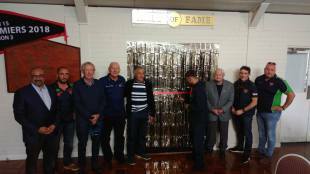 The Northern Saints Hall of Fame was unveiled on Saturday! It was a fitting gesture to have such influential people from past and present for the unveiling of our brand new Hall of Fame. The ribbon was cut by Samuel Kosmak, current Under 17 superstar and the most successful Northern Saint’s player to date. 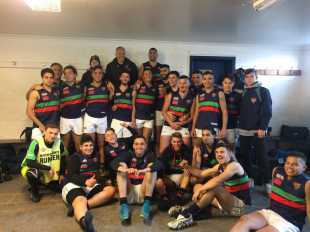 It was a big round 1 with senior and junior sides playing their first game of the 2019 season. The weekend also featured the under 15 girls team playing their first ever EDFL competition match! Check out the results for all sides below. 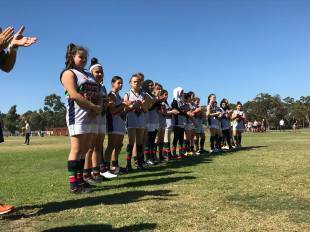 Northern Saints Girls first ever EDFL match! The under 15's girls match at Ormond Park on Sunday was a historic day for two football clubs! The home side Moonee Valley unfurled it’s premiership flag from 2018, whilst our Northern Saints girls team played their first ever EDFL competition match. 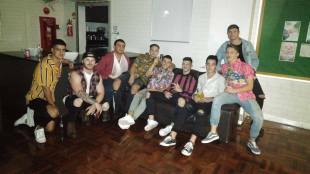 There were some great vibes at the player organised ‘Worst Shirt Party’ on Saturday night. Thanks to our 2 special guest DJ’s Daniel Boudoloh and Jonathan Iapichello, who helped encourage some very uncoordinated dancing whilst keeping our lovely neighbours awake till the wee hours. Also, a big thanks to everyone who came down and got in to the spirit. 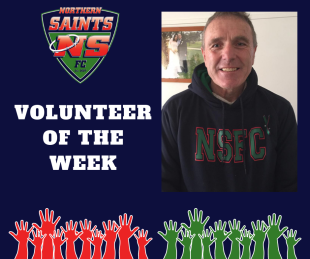 Following on from a suggestion from one of our Facebook followers, Max Ianello, we thought it would be a great idea to ‘Name and Fame’ the Northern Saints’ Volunteer of the week. This week, it’s Fawkner’s own, The Rock, Dwayne Bulmer! Presidents Luncheon and Past Players and Sponsors Day this Saturday! This Saturday is a huge day for the Northern Saints Football Club with our first home game of the season against local rivals Hadfield! 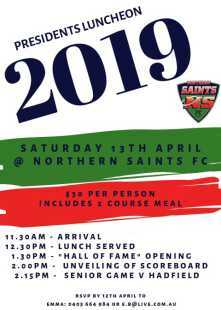 There will be a lot happening at the club with new President Joseph Antonetti hosting the Presidents Luncheon, the unveiling of the new scoreboard, the opening of the club Hall of Fame and Past Players and Sponsors Day! 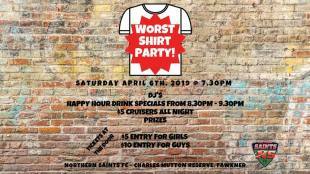 Worst Shirt Party - this Saturday! Don't forget the Worst Shirt Party which is this Saturday after the first game. Hopefully we can celebrate 3 wins in style, or more likely, with no style. This is a player organised event, so let's show them some support and have some fun. The 2019 Junior seasons kick off this Sunday! It is a historical day for our football club this coming Sunday. Let’s all make an effort and get behind all of our junior sides, especially our Under 15’s girls team who play their first ever competition match. 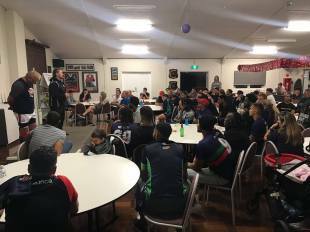 It was a great first selection evening last night at the club, with a lot of numbers and a good vibe. It was really pleasing to see some new and familiar faces enjoy the delicious meals on offer by Dipper and Dolly. With the start of the 2019 season only a few sleeps away, we still have some important roles to fill at our club. 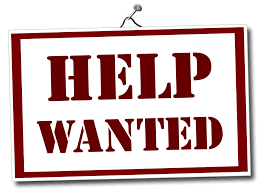 Our Senior Team is looking for a Team Manager. If you love local footy, would love to get involved, and still have a passion for being in a team atmosphere, please contact the club today. Do you have old playing gear that doesn’t fit you or your child anymore? Have you outgrown your current playing uniform or even football boots? There are people at our football club and all football clubs for that matter that may not be as financially stable as you are, and could do with donations of any kind to help their child play the sport they love with no financial boundaries. 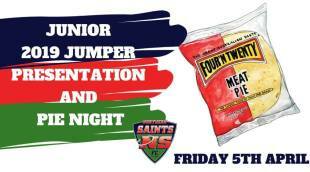 Please note, the new date for the junior jumper presentation and pie night. The presentation night will now be this Friday. the 5th of April to accommodate all teams. We apologise for any inconvenience or confusion that may have been caused. After a long and tough pre-season, the 2019 season is upon us! 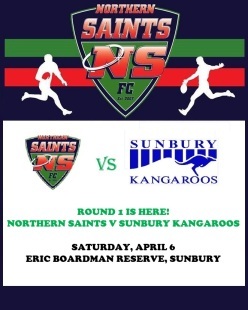 Make sure to get to Eric Boardman Reserve in Sunbury on Saturday as we kick off the 2019 season against the EDFL’s newest side, the Sunbury Kangaroos. The 2019 leadership group has been announced with Tamer Abdallah as senior captain. He will be joined in the leadership group by Eliot Kako, Peter Dispenzeri, Aaron D’Cruz and Sammy Malual Deng Mabur. Thomas Kosmak has been named as skipper of the under 19’s, with JJ Cristaudo and Stefan Valensisi as vice captains. Not only do we aim to nurture good footballers and even better people at the Northern Saints, we are now producing our next generation of coaches. 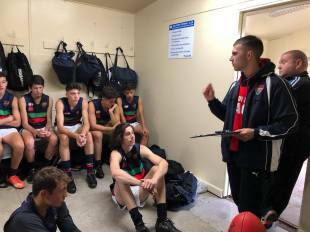 Thomas Kosmak began his coaching career with our Under 17’s team on Sunday with a convincing win against Sunbury. Our Under 15’s girls team had their first official practice match on Sunday against Tullamarine at Mutton Reserve. Whilst we went down by a couple of goals, the girls showed plenty of promise! 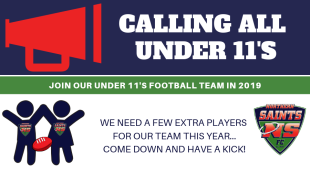 Calling all under 19's players! 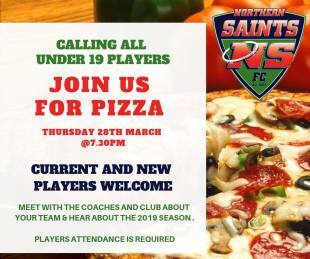 Calling all Under 19 Northern Saints players to come down to Mutton Reserve this Thursday night for free pizzas ansd to talk about the upcoming season with the coaching panel and committee. We invite any potential players to come down to Mutton Reserve, the home of football in the Northern Suburbs. The Saints travelled to Riddell for our final practice matches on Saturday. Whilst, we didn’t end up with the wins, there were some very encouraging performances with round 1 just around the corner. Despite being undermanned and some early injuries, the seniors were very competitive against a strong outfit. 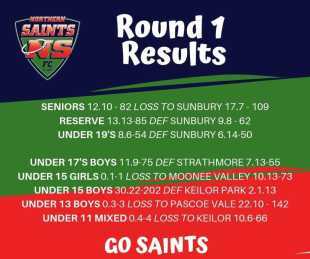 After a tough first quarter, the final three quarters of the seniors match was very tight, holding us in good stead for our round 1 clash with Sunbury, on the 6th of April. 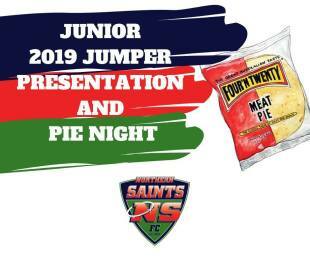 The 2019 junior jumper presentation and pie night will be on Wednesday, the 3rd of April. Join us in the club rooms to get your 2019 season jumper and for a pie and a drink. Northern Saints Girls first practice match! The Northern Saints are very pleased to announce the girls teams first practice match! The girls are pumped. 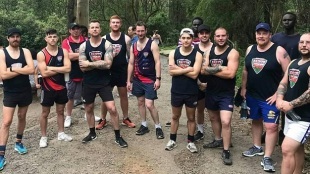 For many of them, it will be their first game of AFL footy, but they’ve been training hard and are keen as mustard. 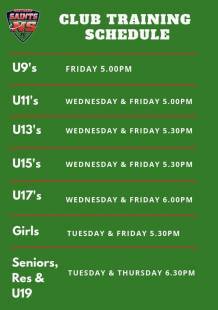 Please find updated junior training times for all teams below. 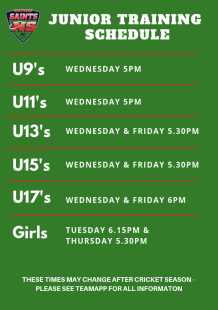 Please make sure to take note of you or your child’s training times, these should see us through to the end of the season. 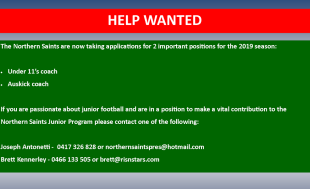 The Northern Saints are currently looking for under 19’s players. 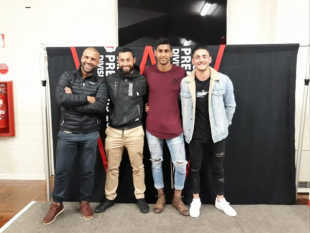 With the season approaching the side has built a promising core, but needs more players to ensure they will be able to field a side. It is vital for a strong, healthy club to have under an 19’s team. If you are interested or know anyone who might be interested, please contact the club, or better yet come to training on Tuesday and Thursday and have a look for yourself! 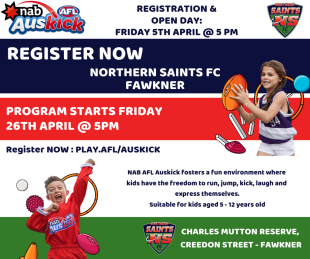 Auskick is a program run through the AFL for girls and boys aged 5-12. Registrations have been opened for some time now. 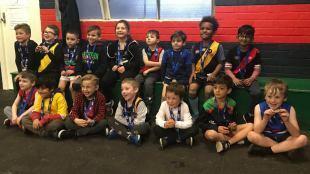 It is vital to our football program that we have good participation at Auskick level, where girls and boys are taught the fundamentals of our great game. Practice match this Saturday against Riddell! 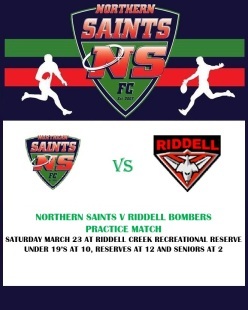 The under 19’s, reserves and seniors take on the Riddell Bombers this Saturday at Riddell Creek Recreational Reserve. The ground is located at 32 Sutherlands Road, Riddells Creek. Get along for what should be an enjoyable day and a great chance to watch the side’s final hit outs before round 1. Junior training is back in full swing with numbers across most age groups fairly settled. However, more players are needed for our under 11's team. If you know of any children who would like to give footy a go, please let us know! It is important that all 2019 players, coaches, officials and match day volunteers are registered with the EDFL as soon as possible. 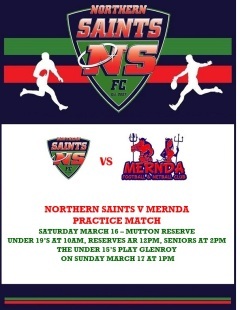 The practice matches against Mernda originally scheduled for this Sunday will now be played on Saturday at Mutton Reserve. The under 15's match against Glenroy will still be played on Sunday at 1pm. 4 practice games this Sunday! 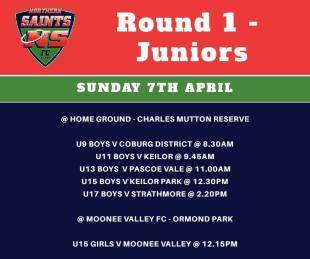 Get along to Mutton Reserve on Sunday for a huge day of practice matches. 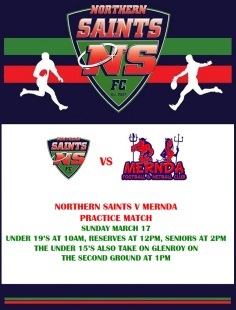 The under 19's, reserves and seniors take on Mernda, whilst the under 15's take on Glenroy. The season is just around the corner and these games will play a vital part in preparing for a big season ahead. Go Saints! With the season just around the corner, training is ramping up as we prepare for an exciting 2019 season. Please find an updated training schedule below. With the season less than 4 weeks away, many roles are still to be filled for our teams in both the seniors and juniors boys and girl's teams. Practice match this Sunday against Wyndhamvale! 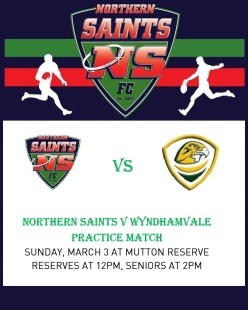 Make sure to get to Mutton Reserve this Sunday as the seniors and reserves take on Wyndhamvale! 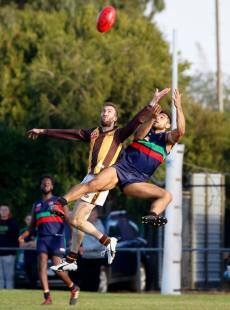 It’s a great chance to see the new look Saints under new coach Brett Kennerley. The barbecue will be fired up and the bar will be open. See you there. 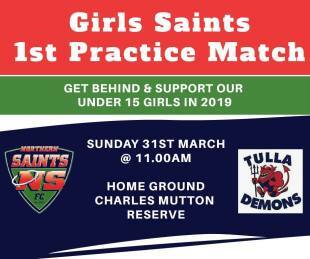 Girls Footy at the Saints on the rise! 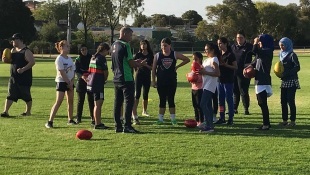 Our girls program continues to grow each week thanks to the assistance of influential women such as Nazish Khan from Merri Health and 'Count Me In 2' and Tamara Mason from the Moreland Council. 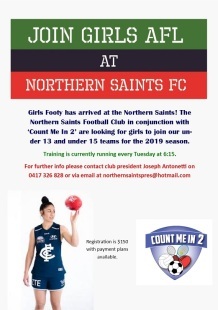 The Northern Saints in conjunction with the Count Me In Project are still looking for players and volunteers for our girls teams. Everyone is welcome! 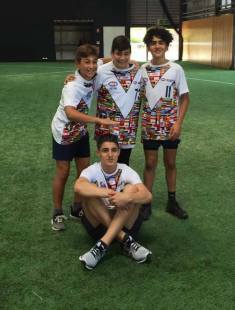 Great news for one of our under 15's stars who has been recognised as not only one of the great multicultural players in his age group in the country, but also for his great leadership qualities! 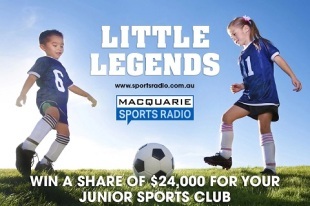 Macquarie Sports Radio is giving Junior Sports Clubs around Australia the chance to win $2,000. We have reached the final stage of voting. If you haven't voted yet, please do so. it's really quick and easy and is a great chance for our club to win $2000. 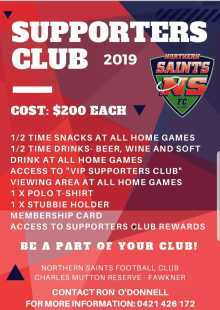 There is no better way to support the Northern Saints than joining the Supporters Club! Enjoy drinks and snacks at half time of every home game while catching up with great people! Package also includes a polo short, a VIP place to watch the games, a stubbie holder, and other club rewards. Enquire at the club about joining, or contact the great Ronnie O'Donnell! 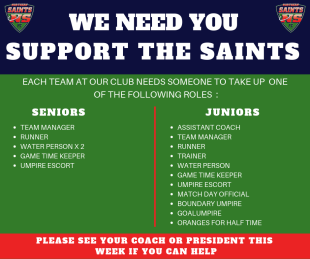 The Northern Saints are seeking suitable people for the roles of Under 11's coach and Auskick coach for the 2019 season! 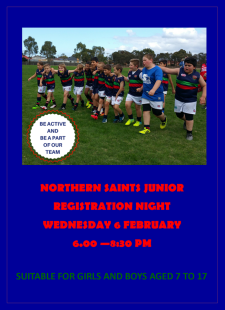 Northern Saints Junior Registration night is coming up on Wednesday the 6th of February. 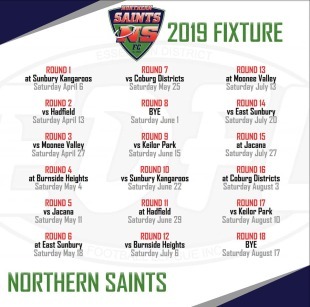 Get along to Charles Mutton Reserve from 6pm to join in the fun and become a member of the 2019 Northern Saints! Time to get back on the track! It's time to kick off training for 2019! Seniors, Reserves and Under 19 training kicks off again on Wednesday the 23rd January at 6.30pm. Get down to Mutton Reserve and get back in action. Welcome to Coburg Osteopathy as a 2019 sponsor! The Northern Saints are delighted to announce Coburg Osteopathy as a sponsor for the 2019 season! Located locally in Bell Street and offering a range of services such as osteo, massage, exercise physiology, naturopathy, pilates and yoga, there's no better place to go for treatment and to get the body ready for a big 2019 season! Welcome to new 2019 sponsor QMS Media! onboard as a 2019 sponsor! QMS is the fastest growing outdoor media company in Australia! Our search for support this season is of utmost importance and as a result we have put together several packages that we feel are mutually beneficial to our sponsors and the club we love.